Today's cards are one of the projects we made at my August Card Club workshops featuring my favorite Circle of Spring Stamp Set and the Timeless Elegance Designer Series Paper. I love everything about this card - nice color scheme, gorgeous Sahara Sand Lace Trim and these two tags layered together using the Tags & Labels Framelits. 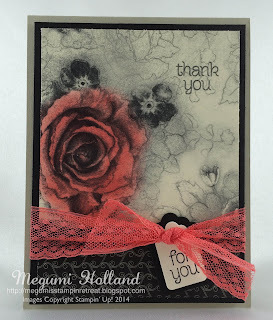 The first card has a light pink color (Blushing Bride) on the flowers. We simply applied the ink with a sponge dauber. Easy and Quick!!! Can you tell what color I used on this one? It's the new Watermelon Wonder with a coordinating Lace Trim. 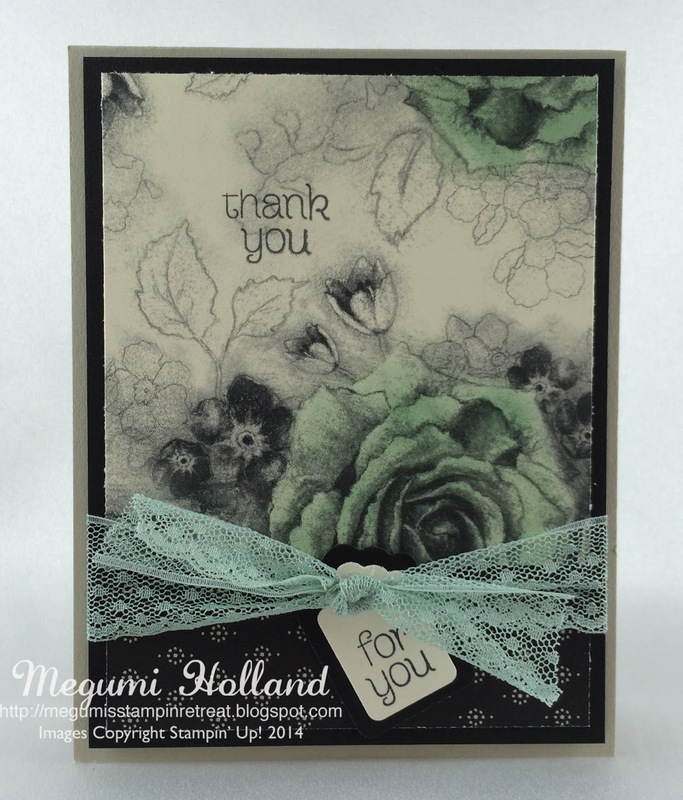 There was a space on the top right corner so I stamped "thank you" directly on the patterned paper. I think it balanced out nicely with the big flower on the opposite side. How about the new Mint Macaron? Absolutely gorgeous!!! 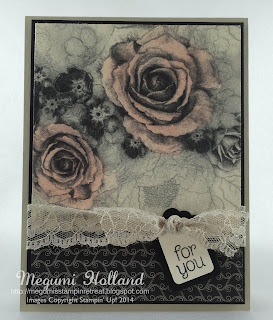 Sahara Sand card stock (card base) - 4 1/4" x 11", scored at 5 1/2"
Basic Black card stock (layer) - 4" x 5 1/4"
Timeless Elegance DSP (flowers) - 3 3/4" x 3 3/4"
Timeless Elegance DSP (strip) - 4" x 1 1/4"